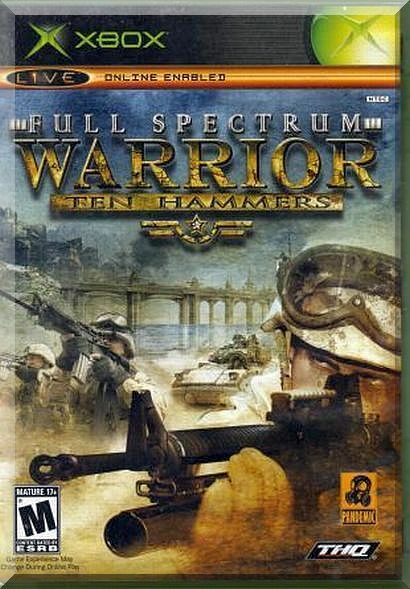 Product Title: FULL SPECTRUM WARRIOR: TEN HAMMERS Condition: Previously played with medium wear to clamshell case - Game Disc is in excellent condition with light scratches to play surface (This title has been cleaned). Includes case, game disc instruction booklet (booklet has medium wear to covers) Game System: XBox Genre: Action Year Released: 2006 Former Rental: No Plot: Full Spectrum Warrior: Ten Hammers is a modern-day war simulation that incorporates authentic squad-based combat with real-time tactical maneuvers. As in its 2004 predecessor, Ten Hammers lets players assume the role of squad leader, issuing commands to multiple infantry squads through 12 levels of strategic action set within the fictitious Middle Eastern country of Zekistan. Although the Al-Afad regime was successfully ousted in the first game, players are charged with the task of restoring stability to a fragmented country that has several militias vying for power. Players are joined by a coalition of forces as they engage in urban warfare from inside the oil-rich city of Khardiman. Each squad is outfitted with the latest in military weaponry, from grenade launchers to sniper rifles, but players can also call air strikes as well as command mechanized units like Bradley Tanks and Armored Humvees. The four-man squad can be splintered off into two-man "buddy teams" for added protection, and players now have the ability to enter interior locales to position snipers. Ten Hammers also lets players take control of an individual unit for precision shooting at specific targets. The Xbox version supports up to eight players in a choice of team-based scenarios, from destroying munitions and rescuing stranded soldiers to gaining strategic control of a monastery and disabling a radio communications tower. Intergalactic Fantasies specializes in hard to find VHS DVD movies, Comic Books related items, collectibles and more!! New items are added weekly!! We have been selling since 1998 and with over 4000 positive feedbacks and growing on eBay we are a seller you can trust.